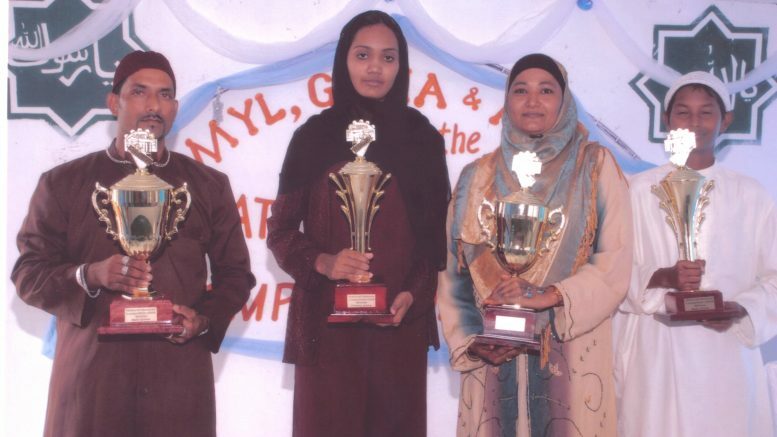 Georgetown 2008-06-25:- Anna Catherina Islamic Complex reigned supreme as its contestants took first places in three of the four categories in the National Qaseeda Competition 2008 held on Sunday at the Anna Catherina Islamic complex on the West Coast of Demerara. Faizul Bacchus sang his way into the hearts of the Judges and the crowd, as he carted away the First Place in the Senior Male Category of the National Qaseeda Competition 2008 (Muslim Songs in praise of Prophet Muhammad (SAS)) held on Sunday last at the Anna Catherina Islamic Complex. In the Female Senior Category, Shameza Baksh of ACIC took the top position while Melissa Rupai also of ACIC took the Junior Female title. Al Ansar Abdul of ACIC took the Junior Male title. The Competition was held to determine persons from Guyana to participate in the International Qaseeda Mehfil to be hosted in Guyana in October this year The International Mehfil will have contestants from Guyana, Suriname, Trinidad & Tobago, Canada, United States of America, Holland, Pakistan, India and England. Be the first to comment on "Winners Row at Guyana’s “National” Qaseeda Competition"